Even if you’ve been grilling all winter—and we hope you have—there’s nothing better than a burger on the first warm day of spring. That first mouth-stretching bite is the stuff dreams are made of. The burger ranks as one of the most popular dishes in the world—at least, if you go by the numbers. According to Jeffrey Tennyson, author of Hamburger Heaven: The Illustrated History of the Hamburger, Americans consume more than 38 billion burgers a year. That’s three a week for each man, woman, and child. Add foreign consumption, and you’ve got a food phenomenon unique in human history. History neglects to tell us whether it was a Mongol, Russian, or German who first had the idea to cook the chopped beef. We do know this: By the time the burger reached North America via German immigrants, it was cooked, beloved, and respected. 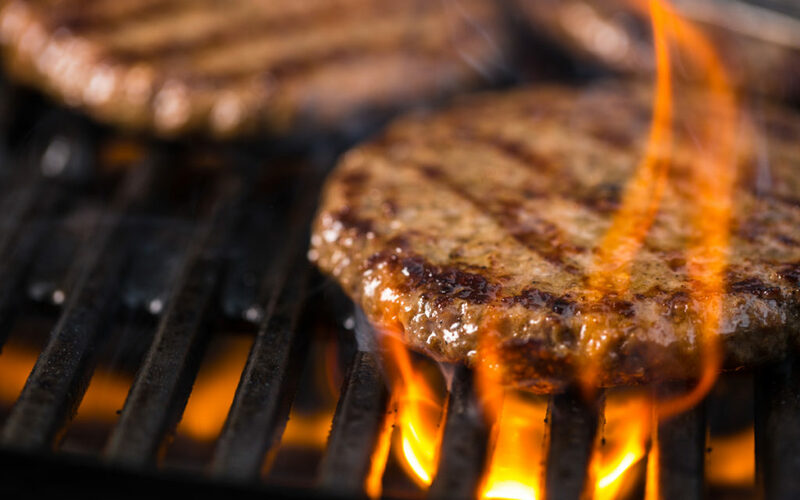 The first U.S. restaurant to put burgers on its menu was the legendary Delmonico’s, which in 1834, offered hamburger steak for the then-princely sum of ten cents—twice the price of roast beef or a veal cutlet. By the turn of the century, the burger had become the food of the masses. They were sold everywhere, from horse-drawn lunch wagons (the food trucks of their day) to soda fountains to luncheonettes. Somewhere along the line, condiments like sliced tomatoes and pickles were added to the topping. And the patty was placed on a bun making the burger the ultimate convenience food. And while you could technically eat the following three burgers on the run, they’re good enough to warrant your full and undivided attention. Who says your burger can’t be made with something other than ground beef, or that it has to be consumed for lunch or dinner? 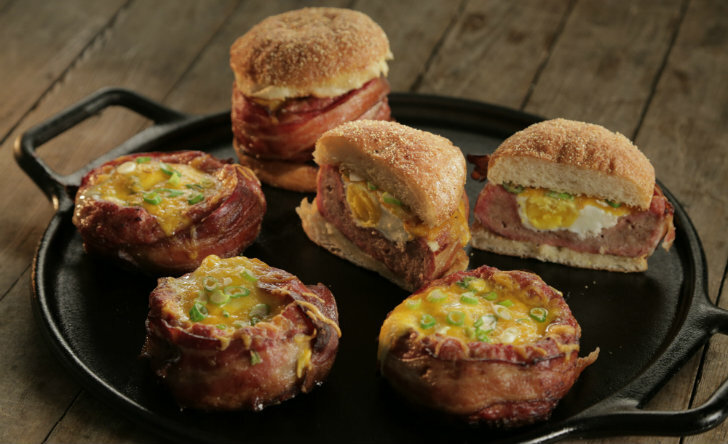 This enticing breakfast-worthy burger is made of sausage shaped around a beer can, wrapped with bacon, bathed in fragrant wood smoke, and crowned with a farm-fresh egg. Serve it bunless to devotees of the keto or paleo diets, or present it on a bagel or English muffin. Cheese is optional. As Steven often says, “Fat equals flavor.” Which is why he’s chosen to incorporate chopped bacon in these delectable pork burgers with smoked coleslaw. We wouldn’t turn down a big dollop of coarse-grained Dijon mustard, either. These days, the FDA recommends cooking all ground meats to an internal temperature of 160 degrees—well done, in other words. To avoid drying out the burger, we’ve stuffed it with a tangy compound butter featuring blue cheese, which melts seductively while the burger cooks. 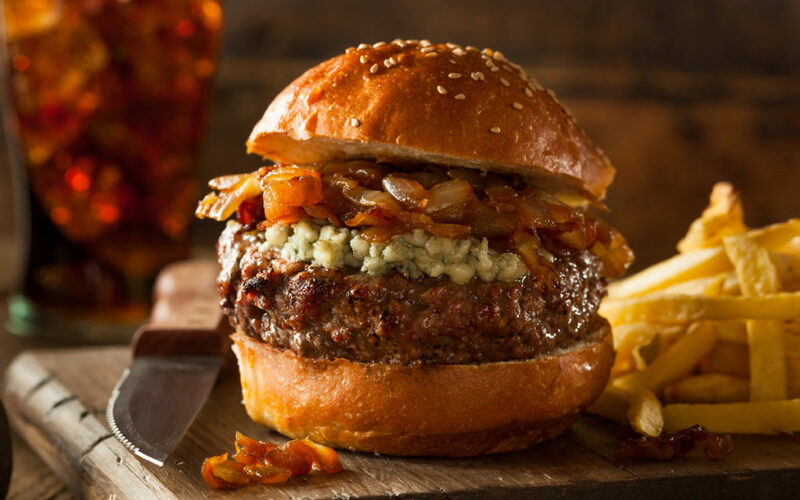 If you’re from the “more is more” camp, top the finished burger with crumbled blue cheese and caramelized onions. Oh, yeah…. Want more burger recipes? Sign up for our newsletter to receive a free ebook of Raichlen’s Burgers, plus weekly recipes and tips straight from Steven Raichlen! Click here to sign up.